Demonstrates adherence to a higher standard of quality, privacy, security and confidentiality as well as data management. Ensures compliance with HIPAA, ARRA-HITECH and other select state rules and regulations. Both Maryland and New Jersey require EHNAC accreditation for EHNs to conduct business in their states. Many payers and providers require EHNAC accreditation in their RFPs. These requirements serve as a model for other states to adopt. If your competitors are not already accredited, they will be soon. 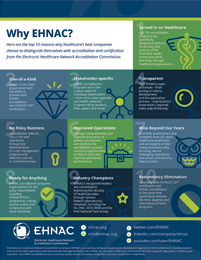 EHNAC accreditation is an important step for remaining competitive, avoiding potential exclusion from future business opportunities, and mitigating your risk of breach of PHI. Many states as well as the federal government have implemented or are considering endorsing various EHNAC accreditation programs. Accommodates industry standards and proper use of NCPDP, X12, HL7 and other formats. Encourages quality improvements in products, services, workflow, revenue cycle and other business practices and policies. Fosters operating cost reductions through greater overall business efficiencies. Provides regular, comprehensive and objective ongoing evaluation of business operations and risk assessment including reaccreditation every two years. Offers information about methods and procedures that can improve your efficiency, elevate your service levels, and position your organization for greater success. Ensures quality employee training programs and provides for additional risk mitigation. Creates a competitive advantage with your trading partners regarding PHI and your overall corporate integrity through ongoing assessment of operations, privacy, and security, as well as policies and procedures. Provides a comprehensive assessment for transmission of data, security, timeliness, accuracy, system availability, capacity monitoring, use of the Internet, data storage and retrieval, and much more. Offers valuable insights and recommendations that assist your organization’s performance improvement. Ensures customer trust in your ability to manage data with integrity and effectiveness. To learn more about the benefits of EHNAC accreditation, read this letter from Lee Barrett, Executive Director of EHNAC.